Honorary Member of ETTU and DTTB, Dieter STEFFEN returned this year to his second “home”, European Youth Championships. Due the health related issues, he was absent for a while, but he decided to put his body to the test and join the caravan in Italy. Dieter STEFFEN is deeply involved in table tennis, especially in youth sport since 1962. He is Chairman of TTC Mennighueffen. 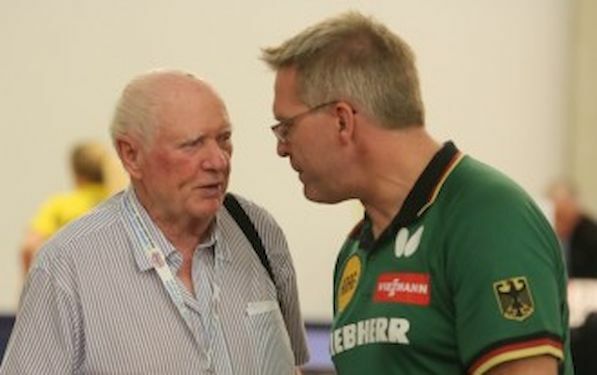 Since 1979 until 2001 he was chairman of the German TT Youth Committee and a member of the Board of the German TTA. In 2001 he was appointed Honorary Member of DTTB; in 1993 appointed member of the ETTU Youth Committee and from that time until 2003 Deputy Chairman of this body. From 2003 until 2010 he was Chairman of ETTU Youth Committee. “I went through chemotherapy, and now I am back. When I saw European Youth Championships would be held in Riva del Garda I was delightful. I could not miss such great opportunity to combine watching our youngsters, see old colleagues with possibility to visit such wonderful place. I am very happy to meet Deputy Chairman Anton HAMRAN, Ranking committee Chair Igor HELLER….and many other officials in ETTU,” said STEFFEN. And what about German team? “I was not involved very much in recent past, but for sure Nina MITTELHAM is great talent. Germany also has good team in boys category. Last time when I was involved Patrick FRANZISKA won the title in Istanbul, and I am proud of BOLL’s, OVTCHAROV’s and BAUM’S achievements since I followed them from young age. In Italy I have not chance to see many matches, but everyone knows Monday is the day when the real battles starts. I am looking forward good games,” stated Dieter STEFFEN.